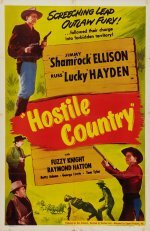 The first of a series of six westerns produced by Ron Ormond for Lippert distribution starring two ex-Hopalong Cassidy sidekicks, which means it also is the first one in the series that was a direct swipe from one of A. H. Hackel's mid-30's Supreme westerns - in this case 1935's "No Man's Range" with Bob Steele - in which Ron Ormond and Maurice Tombragel never looked back while giving themselves an "original" writing credit. Shamrock is summoned to the ranch of his stepfather Henry Oliver whom he has never met. He still hasn't met him when he gets there because Knowlton shows up posing as Oliver. Lucky Hayden is along as Shamrock's sidekick or, to be more specific, the role played by whisker-faced Buck Connor in the original.